Have you been longing for a backyard retreat like those you see on television and in magazines? Are you a little uncertain as to how to create your own personal paradise in your backyard? Here are five ideas that should get you started on the pathway to paradise. Lush green plants can provide privacy for your backyard retreat. You can incorporate stone pathways that amble through your garden and lead to a reclusive place of ultimate tranquility. Colorful, aromatic flowers can be mingled in with the green foliage. A soothing water feature would be a nice addition to your garden. In order to fully enjoy your garden paradise, you’ll need to include some comfortable furniture and maybe a bistro set so that you can relax and enjoy afternoon tea or evening drinks in your private retreat. All you need is a firepit, an outdoor dining set and some comfortable lounge style furniture and you have a backyard paradise to welcome friends and family into. If paradise for you is a quiet evening with the one you love, a firepit and double chaise or outdoor bed and maybe some fine wine is all you need for a romantic evening escape. In-ground pools are expensive and often times not considered an addition that will appeal to buyers if you decide to sell your home. Above ground pools are less expensive, but can provide the same amount of enjoyment. You can add a deck around them and some comfortable furniture and you’ll have a great place to spend many enjoyable summer hours. 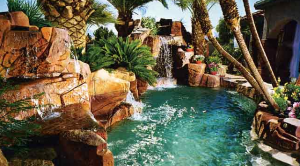 You can add features such as a slide or the increasingly popular pool fountain. Pool supplies are readily available to help you keep your pool in pristine condition. You can transform an ordinary outdoor gazebo into a place of paradise. You can add plants to make it more beautiful. Wind chimes hung on the gazebo can enhance the atmosphere. For privacy, you can add outdoor curtains to the gazebo. Add some comfortable furniture or a hammock to the gazebo and you have a magnificent backyard retreat. Adding ambient lighting to your backyard can make it look and feel like paradise on a moonlit night. To your outdoor seating area you can hang lanterns on tree limbs, add post lamps, pathway lights or string lights to create the ambiance you desire in your backyard retreat. Battery powered candles are also a great outdoor lighting option.